ArtCOP21 is an city-wide climate festival in Paris during United Nations conference of climate change (COP21). From 30 November till 11 December cultural actors will be presenting and displaying all kinds of artistic and cultural work addressing climate as an people challenge and work “to create a cultural blueprint of positive and sustainable change.” Through new ideas and new actions, ArtCOP21 will showcase creative solutions to climate change and positive visions for a sustainable future. ArtCOP21 will be a global platform for change where artists, organizations or collective can participate with different events for free. These events can be exhibitions, installations, meetings, performances, screenings, concerts, readings, participatory workshops, competitions or any other cultural events that address climate change in an inspiring way. 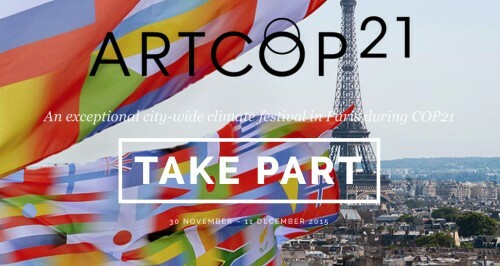 ArtCop21 labelled events can take place anytime between 1 September and 31 December 2015.Cultural and artistic initiatives are invited to take part, both in Paris and worldwide. ArtCOP21 is produced by the two main European organisations mobilising artists and cultural actors on climate issues: Coal (FR) and Cape Farewell (UK).